Sakshi and Vinesh went down in their respective Round of 16 bouts. Olympic bronze medallist Sakshi Malik crashed out in the first round while compatriot Vinesh Phogat's campaign also ended in a whimper as Indian grapplers continued with dismal show at World Wrestling Championship in Paris. After three listless days, the onus was on Sakshi and Vinesh to end India's medal drought but both failed to live up to the expectations. Sakshi and Vinesh went down in their respective Round of 16 bouts. Sakshi was stunned by Luisa Niemesch of Germany 1-3 in women's 60kg, while two-time junior world champion Victoria Anthony of USA got a fall over Vinesh Phogat in 48kg. It was a humiliating defeat for Vinesh, who was unfortunately ruled out of the Rio Olympics due to injury. This was after Vinesh had earlier won her qualification round. Other Indians in the fray today -- Sheetal Tomar (53kg) and Navjot Kaur (69kg) -- also bowed out of the tournament with contrasting performances. Navjot was beaten 5-10 by Mongolia's Ochirbat Nasanburmaa in 69kg, but surprisingly lesser-known Sheetal emerged as the lone Indian woman wrestler to win her Round of 16 round when he got the better of Jessica Mcbain of Australia 10-0 in 53kg. However, Sheetal could not maintain her rhythm and lost the quarterfinals against Estera Dobre of Romania, going down 2-4. There were high expectations from Sakshi, who became the first Indian woman wrestler to win an Olympic medal at the Rio Games last year but she hardly put up a fight today against a lower-ranked opponent. 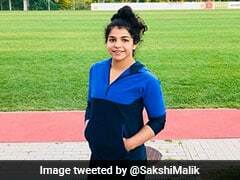 Sakshi had recently climbed up a division to 60kg category at the Asian Championship in May this year, after her successful stint at the Olympics in 58kg. 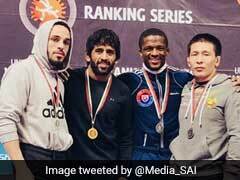 The 24-year-old had finished with a silver medal at the Asian Championship and decided to compete in the 60kg weight division here as well. However, it was all over for Sakshi in the opening round itself. Now India's only hope are the men's freestyle wrestlers, especially Asian champion Bajrang Punia (65kg) and Olympian Sandeep Tomar (57kg) on the last two remaining days of the tournament. 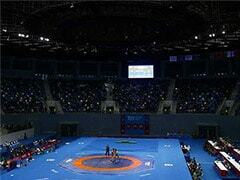 A 24-member Indian contingent had been attending special training sessions at de Bercy's wrestling centre in Boulevard de Bercy borough here since August 6 but the grapplers do not seem to have benefitted by the rigorous practice much.